Fat-free chocolate milk beat out carbohydrate sports drinks at helping to rebuild and refuel muscles after exercise, researchers report. 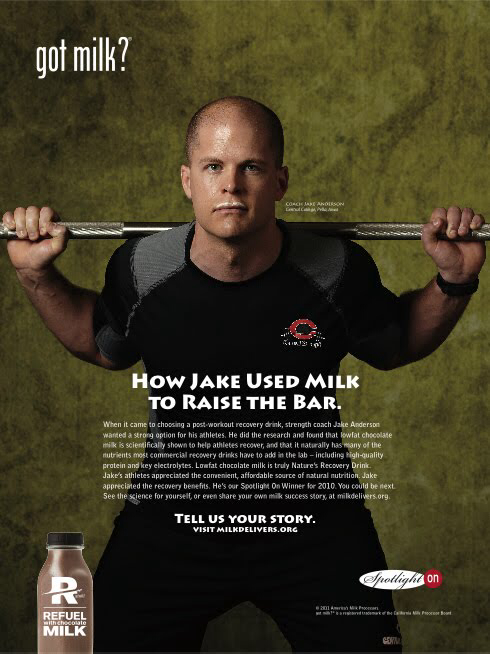 The combination of carbohydrates and protein in low-fat chocolate milk appears to be “just right” for refueling weary muscles, says William Lunn, PhD, an exercise scientist at the University of Connecticut. “It’s not just a dessert item, but it’s very healthy, especially for endurance athletes,” Lunn tells WebMD. Post-exercise muscle biopsies showed increased skeletal muscle protein synthesis — a sign that muscles were better able to rebuild — after the milk drink, compared with the carb-only beverage. While the studies were small, there’s no reason not to reach for fat-free chocolate milk after your next workout, says sports nutritionist Nancy Clark, MS, RD, of Healthworks Fitness Center in Chestnut Hill, Mass. “Athletes can consider it an inexpensive nutritional alternative to engineered sports beverages for help with post-workout recovery,” she tells WebMD. This study was presented at a medical conference. The findings should be considered preliminary as they have not yet undergone the “peer review” process, in which outside experts scrutinize the data prior to publication in a medical journal.